Get ready for a shock! That woman that answers the phone all day and writes those crazy blogs, it is me! Hello, let me introduce myself. My name is not Robin. My name is Stephanie…..Robins. I get called Robin a lot of the time, a common mistake, enough so that I respond to Robin in public. Kind of like all of us moms look around when a kid yells mom and it isn’t our kid. I have been in the plumbing profession since I was 17 back in 1997, did you do the math? Yep, I’m that old. I have a real passion for plumbing and the service profession. I believe in good old-fashioned values and that real value is provided through incredible service and a job well done. I believe in my team and that if I give them trust, respect and loyalty – they will give it to me in return. I believe that If I take care of my team they will take care of our clients. I am only as strong as my team, the foundation of my company – and I have one kickass team that goes out every single day to make a difference in the lives of our clients. I started in a ground level position doing data entry, my ability to type quickly was in high demand for a plumbing company (that shall remain nameless) that was over a year behind on data entry. I walked into stacks and stacks of invoices lining a wall that needed to be entered into the system as well as payments. A year’s worth of data entry in thirty days gave me a great start to understanding a lot of the plumbing lingo. I had no idea that a toilet is called a water closet or that the outdoor faucet was actually called a hose bibb. I learned a lot from reading those invoices, data entry is boring to me, so I decided to make a puzzle of it. I looked for patterns in the invoices and I discovered a lot of mistakes and recalls simply because no one was repairing the plumbing problem the same way. There was no protocol, no system to follow. I would later apply this insight to my own business since the owner of that company did not take this advise into account with his business. I quickly moved into a dispatching position with that company, and that was before software existed to route techs all over the valley. It is funny remembering back to those days; the digital age has certainly transformed the service profession. I sound like someone’s grandma “back when I was young we had to walk to school barefoot, in the snow, uphill both ways to get to school” I devised my own “software”, so I could route technicians efficiently. I couldn’t stand the way the owners wife would send trucks across town from each other. There had to be a better way than sending a plumber from Scottsdale to Glendale and the plumber that was in Glendale crisscrossing and heading to Scottsdale where the other guy just left. I printed a zip code map that included all the major cities in the Phoenix area, including Surprise, Peoria, Glendale, Avondale, Tolleson, Chandler, Tempe, Gilbert, Scottsdale and Paradise Valley. I put the map on a magnetic board and used magnets to represent each truck. I made sure I routed each technician to the closest zip code for efficiency for both the technician and the client. The plumbers loved me for this. You may not know this, but plumbers don’t get paid drive time so the less time they are driving during the day the better they are paid with the same number of hours. This method gave me a super power that I still use to this day, I know all the zip codes by heart and can tell how long it should take to get from one zip code to the next. I use this super power every day at work, but I don’t get to use this super power often outside of the office, it is hilarious when I am able to and people can’t fathom how I know where they live based on their zip code. Over time I quickly took over other roles in the office, from accounts receivable to accounts payable and then running the entire office including human resources and marketing. As I ran that company my hands were constantly tied by the owners of the company and their way of doing things. While the company had a religious name, the company was not operated with Christian values. The company did unethical things daily regarding both its employees and its clients. This was back before social media became such a powerful force in our community and the way you brought in clients was with telephone book advertising. There wasn’t the transparency there is today, and while the digital age has its downfalls there are a lot of benefits for customers to be able to read what other clients, like them have experienced. Having started at the young age of 17 I didn’t have enough world experience to truly understand what was happening around me. It was normal, and it was not only accepted, it was expected. Short cuts, selling products to clients that didn’t need them, creating plumbing problems that didn’t exist to create a bigger plumbing ticket. Unfortunately, these types of business practices still exist in my profession. The horror stories I hear…..YIKES! After becoming disgruntled myself it was time to move on. At the age of 25 I was tired of feeling horrible about myself at the end of every day. I was tired of knowing that I contributed to ripping off a customer or ripping off an employee. 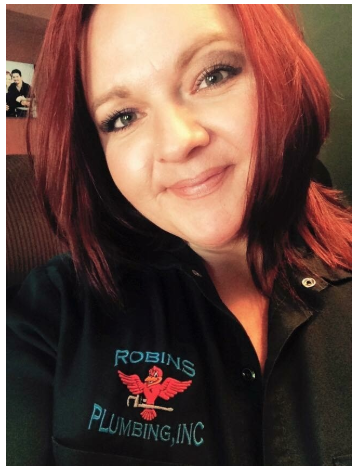 After a lot of thought, and a lot of guts, my husband and I agreed to create our own business – and Robins Plumbing, Inc was born. We loved plumbing and we wanted to bring integrity, trust and honor back to what we feel is an honorable field – plumbing. After working with and interviewing over 100 plumbers in my years with that “other” company, again I saw the pattern, it was normal to be unethical in plumbing. I didn’t want to be normal, like I said, I believe in old-fashioned values and that is how we were going to be different than our “competition”. Our company motto – Finally a Plumber YOU Can Trust 24 Hours a Day said it all. We are the plumbing team you can trust 24 hours a day. Our values and morals are not for sale, in fact, they are included for free with every single service that we provide. I believe if your values are for sale, they have no value at all. It wasn’t easy starting out. We had no funding, no experience as business owners and no business mentors but what we had couldn’t be bought. We have a passion for doing things the right way and a belief in the underdog. Rather than focusing on the multi-million-dollar marketing budgets of other companies we focused on what we have, purpose and a mission to change the profession of plumbing. We worked day and night, literally for 14 years before being able to hire on a team member to answer phones at night and on the weekends. For the first 14 years I ran my company from my home office so I could be a mom and a business owner. I admit the 30 second commute to work and the heavy traffic of 3 dogs wasn’t a bad gig but it meant the sacrifice of never having separation of work and family as Robins Plumbing is and always will be a 24-hour company that prides itself on answering the phones 24 hours a day with experienced employees not an answering service. Believe me if it is 2 am and you’re flooding you will be grateful that you get an experienced staff member and not a recording or an answering service. We chose our business name as our last name, because we were putting our signature on our business, in essence our word. We chose our lime green plumbing vans for two reasons, I love the energetic color and you can’t miss those babies driving down the road providing a great marketing billboard everywhere we go. Our red robin ties in with our name and my husband’s love for the Arizona Cardinals. Our fleet consists large box vans so we can stock a large supply of parts, as we try not to inconvenience you, our client, for any longer than is absolutely necessary. Having a massive inventory of parts reduces the time we are in your home by reducing the need for part running for every little thing, including water heaters. Yes, we stock the main sizes of water heaters right on our van so we can get you up and running as quickly as possible. Basically, I love the plumbing profession, I believe the trades make a big difference in the world and I am absolutely proud to be in the plumbing profession. While I don’t go out and perform the plumbing services, I know what it takes, and I know that I am only as strong as a business owner as my team is. I believe that focusing on my team IS focusing on my customers. Like the adage goes, happy wife happy life, well the same can be said for happy team, happy clients! The more united my team, the better the experience is for our clients. That is why we do so many team things together, we become a family that bleeds green. Being a woman owned plumbing company that is focused on culture has been a fun and interesting experience for our team members. They’ve taken pottery classes – and loved it! We’ve taken them to champagne brunches so they get the opportunity to dress up and experience the finer things in life. We also do some fun things that include their family, like pool parties, bowling night, Top Golf and cookie decorating classes. We also have our man-only events that even I don’t go to. The guys love going to the Modern Round and shooting zombies. I know, you’re surprised! When you choose the team of Robins Plumbing, you choose a tight knit family-oriented team that takes pride each and every day in what we do. Whether you’re a client looking for a plumbing company or a plumber looking for a plumbing company when you choose Robins Plumbing you can expect everything we do to be based around our company culture and values; Trust, Dependability, Teamwork, honesty, Fun, Loyalty, Education, Growth, Respect, Integrity, Family and Appreciation.